Adults – around 6mm their bodies are oval and flattened. Recently fed they will then change to a red – brown colour. They have piercing mouthparts adapted for sucking, simple antennae, legs and claws for clinging on to hosts, whilst feeding. Eggs – Up to 200 are laid in a life time. 4 – 5 are laid per day and are glued in cracks and crevices. Newly hatched nymphs are no bigger than a pinhead. These only hatch above 13°C.- Nymphs – 5 moults taking from a few weeks to several months depending on food and conditions. Limited access to a blood meal extends the development time. As they grow, they shed their skin. A blood meal is needed between each successive moult. They can be found in any cracks and crevices such as: headboards, behind peeling wallpaper, broken plaster, light switches, plug sockets, under carpets and skirting boards. Their flattened bodies enable them to fit into tiny crevices but are also found in soft furnishings such as clothes, mattresses seams, curtains, bed sheets. Feeding usually takes around 10 minutes and although nocturnal they may appear in the day when hungry. Bed Bugs prefer to hide close to where people sleep. They lay dormant and wait until a host is asleep before feeding. Many people will be bitten without even seeing any evidence of the bugs.- Although Bed Bugs prefer feeding on humans, they will also bite other warm-blooded animals, including pets. 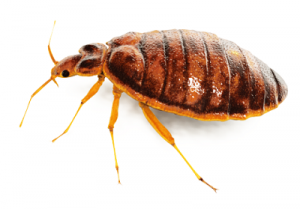 Bed Bugs can be transported on clothing, in luggage, bedding and furniture but are very rarely found on hosts. They can ingest 7 times their body weight in blood. This enables them to go for prolonged periods without feeding. The adults are highly resistant to starvation (up to one year) and low temperatures so thorough treatments of surrounding areas must be carried out.